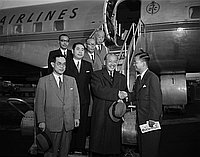 Izumiyama Sanroku arrives at airport in California, October 7, 1955. Smiling mustached older man shakes hands with another man in front group of five men standing on airplane ramp stairs. Typed on original negative envelope: Izumiyama Sanroku.